name="fieldName" - Specifies the name of this field. 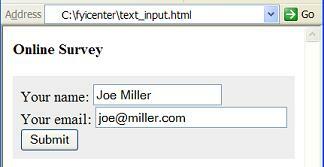 value="defaultValue" - Specifies a default value for this field. size="number" - Specifies the size of the input box in number of characters. maxlength="number" - Specifies the maximum length of the input data. Your email: <input type="text" name="email"